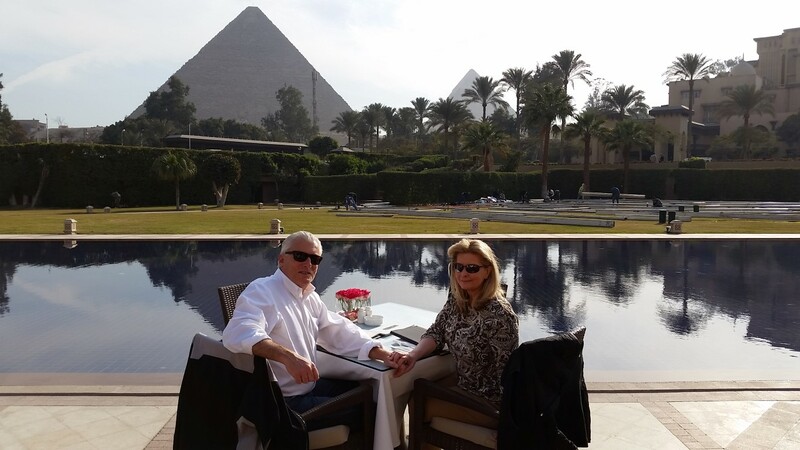 "After breakfast at the hotel, you depart via private Coach with the guide to the Pyramids of Giza, where you’ll embark on an unforgettable tour of the pyramids built for the Pharaohs Cheops, Chefren, and Mycerinus. 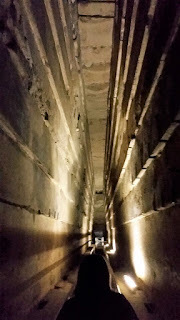 They were constructed about 2500 B.C. with limestone blocks from the plateau and the Turah hills on the outskirts of Cairo. 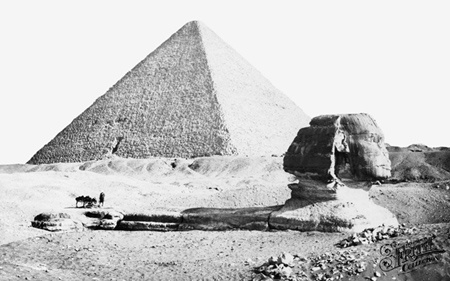 The Great Pyramid of Cheops alone, the only present-day survivor of the Seven Wonders of the Ancient World, required over 2,300,000 blocks of stone, each weighing about 2.5 tons. At its base, it covers 13 acres of land. You’ll also tour the Valley Temple, housing the mysterious Sphinx, located in what was once a quarry to the east of Chephren’s pyramid. One theory suggests this Pharaoh's workers shaped the body into a lion and gave it their king’s face, as a guardian of the necropolis. Almost a thousand years after its construction, King Thutmose IV placed a stela between the front paws. It describes how the Sphinx had spoken to their prince in a dream, promising him kingship if he cleared away the desert sand that was choking the Sphinx. 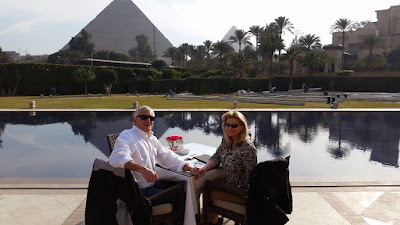 – Then around 02:00 pm, we booked a private lunch at the Terrace of Restaurant 139 at the Mena house with great look Over the Great Pyramids and celebration of Mr. Mike Birthday." As usual, Sigrid was right. Back to the tour. Today is arguably carrying the highest expectations of the tour. It is our first ever view of the Great Pyramids of Giza and the Sphinx. We arrive with the sun peaking over the top of the Pyramid of Cheops and proceed to do all the things tourists do when confronted with the last standing "7 Wonders of the Ancient Word". 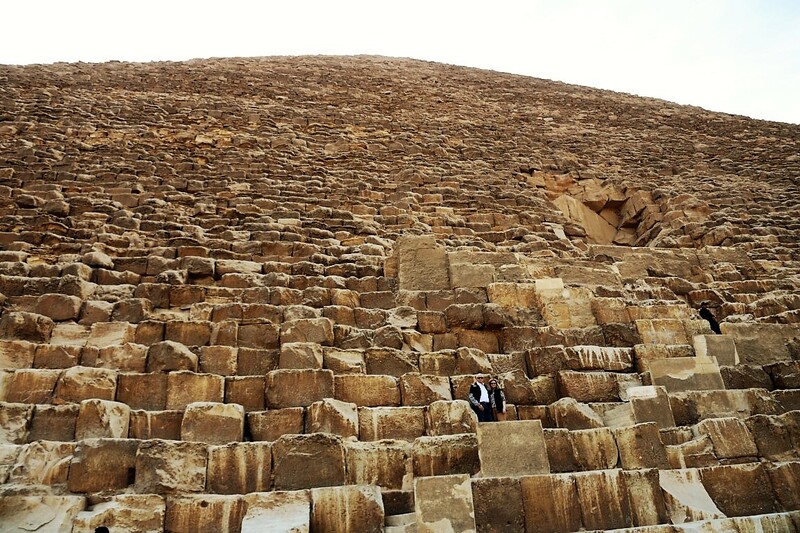 We walk around and photograph the Pyramids. We mingle with touts, hustlers, and other tourists around the pyramids. 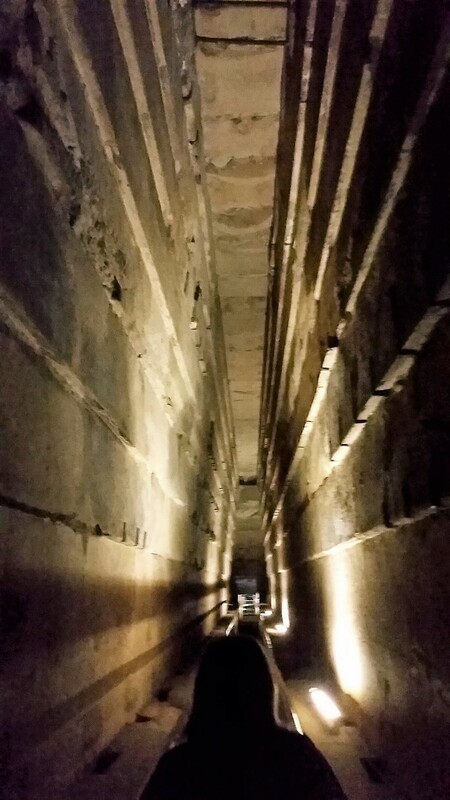 We pay the fare, climb to the entrance of the steep small claustrophobic tunnel carved into the burial chamber inside the pyramid. ... pose for cheesy trick photographs. Sigrid demonstrates how blocks were transported to the pyramids. The pyramid experience lives up to our high expectations. As does gazing at the Sphinx. "After years of waiting, it was before me at last. The great face was so sad, so earnest, so longing, so patient. There was a dignity not of earth in its mien, and in its countenance a benignity such as never any thing human wore. It was stone, but it seemed sentient. If ever image of stone thought, it was thinking. It was looking toward the verge of the landscape, yet looking at nothing—nothing but distance and vacancy. It was looking over and beyond every thing of the present, and far into the past. It was gazing out over the ocean of Time—over lines of century-waves which, further and further receding, closed nearer and nearer together, and blended at last into one unbroken tide, away toward the horizon of remote antiquity. It was thinking of the wars of departed ages; of the empires it had seen created and destroyed; of the nations whose birth it had witnessed, whose progress it had watched, whose annihilation it had noted; of the joy and sorrow, the life and death, the grandeur and decay, of five thousand slow revolving years. It was the type of an attribute of man—of a faculty of his heart and brain. It was MEMORY—RETROSPECTION—wrought into visible, tangible form. All who know what pathos there is in memories of days that are accomplished and faces that have vanished—albeit only a trifling score of years gone by—will have some appreciation of the pathos that dwells in these grave eyes that look so steadfastly back upon the things they knew before History was born—before Tradition had being—things that were, and forms that moved, in a vague era which even Poetry and Romance scarce know of—and passed one by one away and left the stony dreamer solitary in the midst of a strange new age, and uncomprehended scenes. The Sphynx is grand in its loneliness; it is imposing in its magnitude; it is impressive in the mystery that hangs over its story. And there is that in the overshadowing majesty of this eternal figure of stone, with its accusing memory of the deeds of all ages, which reveals to one something of what he shall feel when he shall stand at last in the awful presence of God." 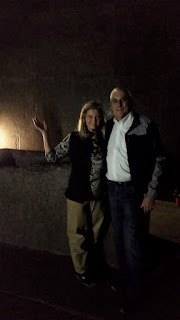 We finish the day with a late lunch at the Mena House Hotel, that my Travel Director, best friend and and lover arranged for my birthday. Chocolate cake for lunch and more cake (strawberry) when we got back to our room with a view. Oops, hoping your Birthday was wonderful, Michael. How could it not be?